The leading challenger to Prime Minister Benjamin Netanyahu said in a published interview Wednesday that Israel should "find a way" to end its control over the Palestinians. Gantz, a former general, has shot up in opinion polls since last week's speech. Leading a new centrist party called "Israel Resilience," he has emerged as a formidable challenger to the front-running Netanyahu in April 9 elections. FILE - Israeli Prime Minister Benjamin Netanyahu chairs the weekly cabinet meeting at his office in Jerusalem, Dec. 16, 2018. His opponents quickly lambasted him. 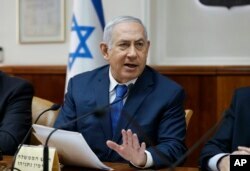 Netanyahu's Likud Party warned that Gantz would form a "leftist" government backed by Arab parties, while the hardline nationalist "New Right" party claimed that Gantz is planning on "expelling" more Jews from their homes.